Celtic love knot ring, sailors knot, Celtic eternity knot, half of a square knot, or around here in Pennsylvania, an Amish Pretzel knot! Perfect union of two creating an eternal knot. 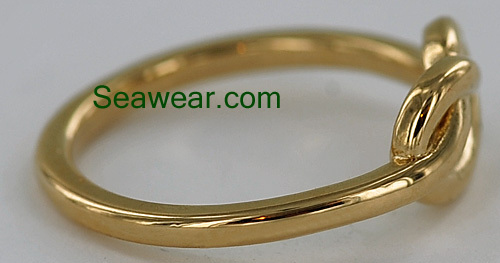 The model ring is a stock size 6.5 and weighs 3.5gms. 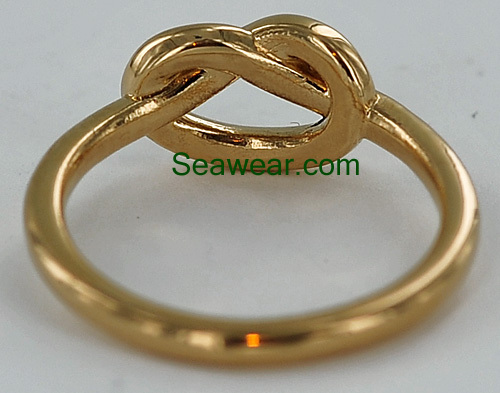 The love knot is approximately 7mm tall and 12mm wide or 1/x" by 1/2". The band is about 1.75mm wide and 2mm thick. This would be between a 12 and 14 gauge wire. 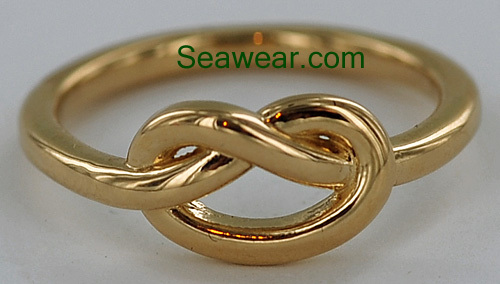 The pretzel knot love knot rings are a cast design, via the lost wax casting method. This allows working in the wax stage so the knot is not abrupt in the crossover and more uniform width all around. Easily sized up or down by your jeweler. Having the ring made made to a specific size will increase the cost and time. The ring is available in yellow, white, rose or green gold; 18kt palladium white gold or platinum. Allow 2-4 weeks for yours to be made. These are Irish designed and American made! 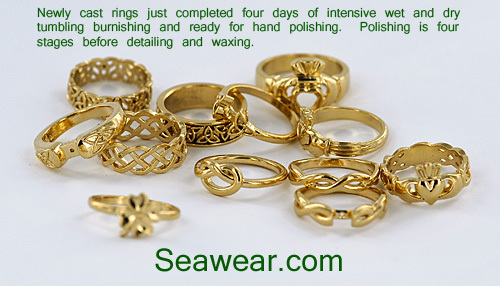 Above Celtic pretzel love knot ring can be seen in this batch of newly cast rings. Just completed 36 hours of extra fine walnut shell tumble and on to the hand polishing.